THE German election race will be resolved tonight with Angela Merkel and Martin Schultz committed to take on the AfD in the polls. Here are live updates and the latest polls for the final hours of the German election. 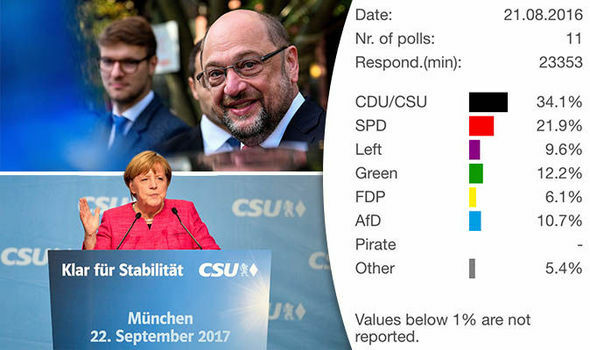 The latest election polls from Germany show that Angela Merkel’s Christian Democrats (CDU/CSU) are in the strong lead ahead of Martin Schulz's Social Democrats (SPD). The polls also suggest that incumbent Chancellor will be forced to strike a coalition deal with the SPD, or a potential three-way alliance between the CDU/CSU, Greens and liberal Free Democrats (FDP). One party to look out for, is the controversial AdF which has grown in support in the run up to the election. SPD official Thomas Oppermann has said that the Social-Democrats should rule out grand coalition with Mrs Merkel’s CDU again. The only feasible option left for the Conservatives, is to strike a 'Jamaica' coalition with the Greens and FDP. The shockingly low voter support for the CDU/CSU has come as a surprise to some, who expected Angela Merkel’s party to stay strong. Robin Gramer, Robbie Gramer, a national security reporter at Foreign Policy tweeted: “Breaking: Merkel wins German elections. Overshadowed by: For the first time since 1945, a far right party will be in German parliament according to exit polls. Far right AfD party gets 13.5%. Many centrists had hoped for a 8-10% maximum. “‘’This is a slap in the face’ one German campaign operative tells me. “CDU campaigner tells me what an SPD campaigner told me earlier: ‘This is horrible’”. Melinda Crane, the chief political correspondent at DW, expelled that the shockingly poor results for the CDU, prove that voters are fed up with the status quo. “Yes they like the chancellor personally, yes they know that she is esteemed abroad and that pleases them as well. “But there is a feeling that the country is adrift, that its’ not really preparing for a future that will hold a lot of challenges. Demographic challenges. Economic challenges. “As you know and I think it’s been mentioned, investment has been very low under a Conservative led government. “So I think that there is a general sense of unease even among mainstream voters, and if you look at these results, it’s quite interesting to see that all of the smaller parties have done better. "All of them across the board, meaning people are migrating away from this two big mainstream parties that used to be called the ‘Volksparty’ in Germany – the parties of the masses. “They are shrinking to a size, particularly the SPD, where they no longer qualify for that term. That’s a historic turning point for the SPD. The first round of exit polls suggest that Angela Merkel’s CDU/CSU won a minority victory. If the result stay on course after the ballot count, Mrs Merkel will need to find allies that will help her strike a coalition. “Greens with a strong result, will help leadership to convince members of a Jamaica coalition,” said Christian Odendahl, of the Centre for European Reform. Robbie Gramer, a national security reporter at Foreign Policy, claims t have seen leaked exit polls that gave the AfD 15 per cent in the polls. He said in a tweet: "Some leaked poll numbers I saw put Germany's far-right AfD party above 15%, which is astonishing. (Caveat these are early exit poll numbers)”. The main worry in the run up to the election was that AfD voters would admit to their choice of party in the opinion polls, skewing the result before election day. Ron Nehring, a former US National Spokesman who is currently at the CDU headquarters in Germany, thinks that the German left will be extremely disappointed with the election results. He said in a tweet: “I get the sense the left in Germany is heading to a crushing defeat, extremely poor showing in today's election. First results in 20 mins. "In Jan, Merkel's party tied w/ socialists, 32-32. Tonight, she'll roar back into office as SPD and Greens collapse." Mathieu von Rohr, deputy head of the Der Spiegel Foreign desk, thinks that entering the Bundestag will be enough of a victory to cause and upset in Germany.